Whether you are planning a new industrial building or need repair or maintenance work on an existing industrial building, you want to work with a team of professionals who can handle the job correctly the first time. It is important to get your building finished quickly while maintaining a high standard for the construction process, building materials, and overall design. After all, you want to get back to work – or get started working – swiftly, but you don’t want to cut corners. Galbraith/Pre-Design, Inc. has the experience, knowledge and connections to ensure that your industrial construction project goes smoothly. Our value engineering process helps to lower the cost of your finished structures while maintaining the highest level of quality, both in construction and in service. You’ll enjoy a favorable bottom line impact on your construction investment, and a largely stress-free construction period due to our integrated approach to project management. You will enjoy full-time on-site supervision, workflow adaptability and construction schedule control, among other benefits, when you choose to work with us. For years, we have been helping clients plan, build, or renovate their industrial buildings and plants. We take the time to understand your facility’s operations, so that we can make sure the choices we are making as a team are the best possible decisions for your construction project. Having this in-depth knowledge of your facility’s operations allows us to eliminate wasteful spending by ensuring that you are only building what you need, instead of adding modifications that may not be the wisest investment for your structure. Our process will also help you anticipate future maintenance and schedule it ahead of time, so that you will not be unprepared when the time comes. Because we are dedicated to providing you with the highest level of industrial building and renovation services, our team has undergone extensive training to further guarantee our understanding of your industry’s specific needs. This allows our team to help you select the appropriate materials for your project, and helps to avoid any delays in production due to write-ups and plant shut-downs by the USDA and FDA. Galbraith has the expertise and supply network to acquire the materials you need, no matter what your industrial construction or renovation project requires. We’ll work with your production schedule to complete your job and accommodate your business, even if that means working weekends or overnights to get your industrial construction project finished on time. In addition to providing you with high-quality industrial construction and renovation services, Galbraith can also assist you with your industrial painting and pipe labeling needs. We understand the regulations that call for specific colors of pipes and tanks, and the specific labels necessary for easy identification by emergency responders when necessary. Even if your specific industry does not require painted pipes or tanks, it can still be a good idea. Paint can help prevent rust and corrosion, saving you time and money on repairs in the future. 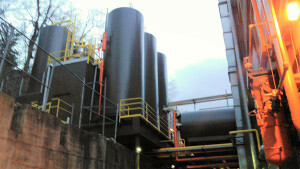 We are happy to help you paint or re-paint your industrial pipes, tanks, and whatever else you may need painted. At Galbraith, we are here to provide you with only the best in industrial contracting services. From your initial consultation to your final walk-through, we are dedicated to ensuring that your project is run smoothly, without surprises or unexpected expenses. All of our contractors are pre-qualified to work with industrial buildings, and no project is too big or too small for our team to handle. If you want to work with a local industrial contractor with extensive experience, a dedication to honesty and integrity, and a team that believes in providing you the best work at a cost that is great for your bottom line, turn to the team at Galbraith. We believe that our work is defined by your satisfaction and the relationships we forge with our clients, and it is why we continue to work on award-winning projects every day. Whether you want to start your industrial construction project with us or you have questions you would like us to answer first, do not hesitate to contact us. We’ll happily help you with anything you need, and would be delighted to show you what our team of seasoned professionals can do for you. Take the stress out of industrial construction, renovation, and maintenance by working with a team who has been extensively trained in all aspects of industrial work.